McKinney, a North Carolina-based agency specializing in branding whose clients include Audi, Golds Gym and Sony, recently worked with Sherwin-Williams to develop a multifaceted advertising campaign consisting of TV, print and online media. 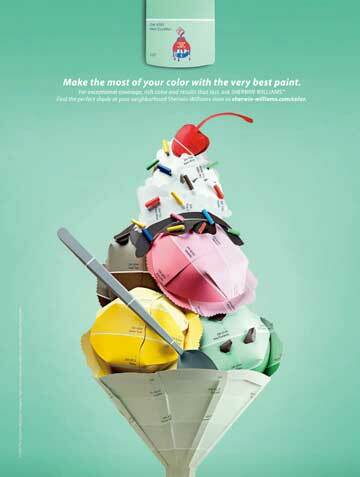 Four individual print ads feature original paper sculptures created by Matthew Sporzynski, who used multiple color chips/swatches to create each sculpture: flowers in a vase, a toy giraffe, a bird house and an ice cream cone. The campaign focuses on the process of selecting a color and how color can be used to tell a story while showcasing the immense selection of colors – 1,500 of them – available at Sherwin-Williams’ paint stores. The ads will appear in a number of publications, including Architectural Digest, Better Homes & Gardens and Good Housekeeping. Find more information and content on McKinney’s website. This entry was posted in Design Matters and tagged ad, brand, campaign, chips, color, Matthew Sporzynski, McKinney, paper, sculpture, Sherwin-Williams, swatches by William. Bookmark the permalink. William is the principal designer of Scott Creative, a creative services and design studio located in Omaha, Nebraska.